Around 100 people, including Swarup’s family and friends and several members from the Save India Family Foundation — an organisation that claims to work for “men’s rights” – were present. The family of a senior Genpact executive, who committed suicide on December 18 after he was suspended over allegations of sexual harassment at work, held a protest outside the office in Noida’s Sector 135 on Monday. Swarup Raj’s family alleged the company was responsible for his suicide. A legal representative submitted a letter to the company on behalf of Swarup’s wife, seeking a copy of the complaint made against him by two women employees. “We have been claiming from day one that he is innocent and that the rash decision by the company to suspend him without prior notice is what caused his death. It is not suicide, it is murder. We have not been told anything about the incident. We want clarity from the company,” alleged Swarup’s father PK Ranjan, addressing the crowd. 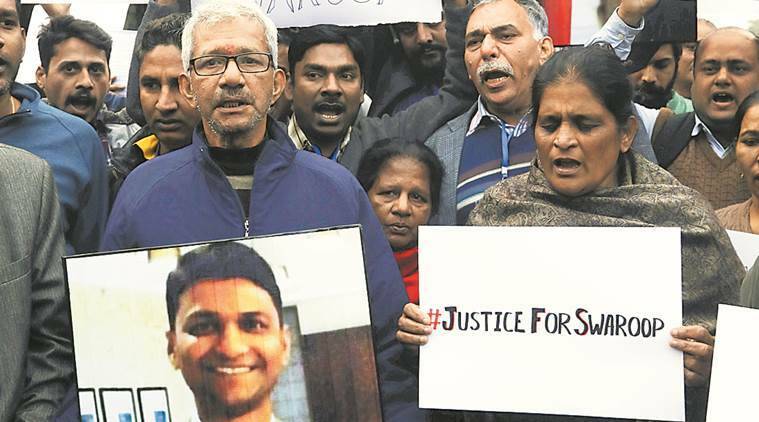 Among posters at the protest were ‘Justice for Swarup’ and ‘MeToo claims lives’. Swarup’s wife did not turn up as she is unwell, the family said. Police had earlier filed an FIR under IPC Section 306 (abetment of suicide) against a senior company official and the two women who had accused Raj. A statement issued by the company, meanwhile, said: “A deeply unfortunate… event has occurred. We are dealing with the loss of an employee just the way the family and friends are. We are cooperating fully with the authorities and maintain our stand that we followed the process in accordance with law.” The company refused to comment on the protest.